This is a guest post by Cédric Foellmi, the developer of a Mac App called iObserve. After more than a year of development, starting almost from scratch, iObserve is now a stable and complete app aimed at planning and performing professional astronomical observations. 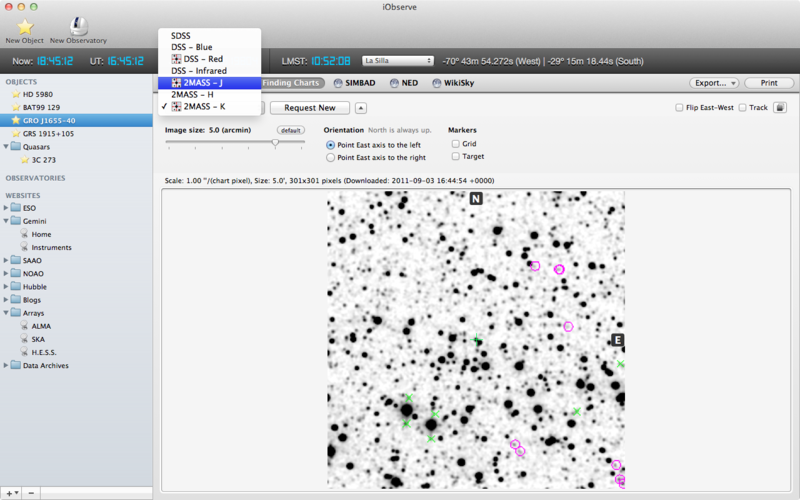 Like many software, iObserve is the app I would have loved to have years ago, when I was a support astronomer in La Silla Observatory, in Chile. This is my main motivation. Having left research, I am now a professional Mac and iOS developer in a small start-up during the day, and an indie one during my evenings. iObserve ($12, Free Demo) is an app that I have developed to let you prepare your observations; bringing a wealth of useful information by simply entering the name of an object. Once entered, its coordinates are automatically resolved and iObserve provides the trackable airmass curve, the closest (currently Landolt, UKIRT & UVESPOP) standard stars, aliases with ViziR links, the latest 100 ADS references, a way to easily change coordinates to celestial or galactic, for whatever epoch and units, and many other little niceties. Of course, airmass curves can be compared and the date of the observing night can be slided up to easily match future observing runs. The night itself can be scaled up and down, and shifted (if you need to observe during the day…). 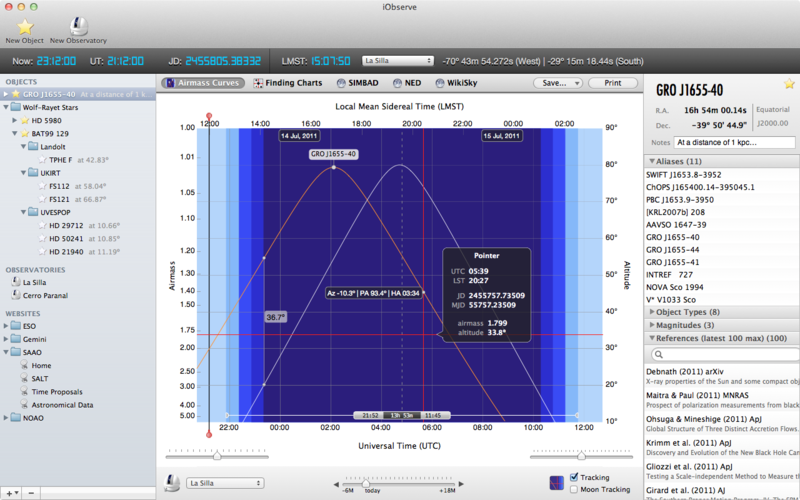 iObserve also provides its famous Times Bar with times of UT, Local, (Modified) Julian Day and the Local Mean Sidereal Time of an observatory. New in the latest 1.0.5 version are Finding Charts! You can now easily download charts from DSS, SDSS and 2MASS in various photometric bands, with plenty of options. 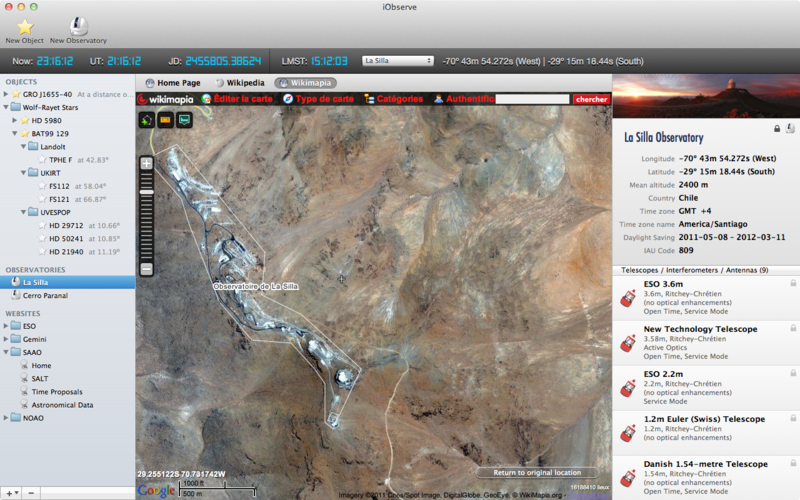 Also new in this version: an “Observatories” section to easily access observatory information, websites, and map. And if you need an observatory that isn’t in the pre-defined list—whether it’s your astro club meeting place or your backyard—you can create your own! It was my first intention to target a pro audience with this app. But many amateurs would love to have a pro app to make BIG observations with their respectfully-sized telescopes! Hence iObserve is built really with both in mind. The number of things I dream to include is very large. However, as I only code during my evenings, I try to find a balance between the perfection of a polished app and the number of features. On the other hand, iObserve development is really user-driven. One day I got a mail from a user who said “I am happy with the app, but with Finding Charts, it would be perfect!” I have a development cycle of about six weeks (a bit longer during summer vacations, and for major releases). If possible, I try to include a feature request right away in the current cycle. So don’t hesitate to drop me a line or leave a comment below! As I write this post, I’ve already started to implement one of the top requested features: comets and asteroids. But the next big things I have already started (capitalizing on work already done) are Observing Runs, Event Streams (ATels, GCN telegrams, etc); Converters (Times, Coordinates, Fluxes, Distances), Observation Simulator (fed by a community-driven platform to share Observatories/Telescopes/Instruments information), etc. Apart from the simulator, all these features are already partially implemented but need to be finished (and that’s where the evil resides). Ultimately, iObserve should include Night Logs that are written during the night, right in front of you, with all kind of statistics generated at the end of the night and run. The structure of the app is already designed to support that feature. The future is bright. I just need to choose what’s most fun to add first. Let me know what *you* would like to see first! Huh no, it doesn’t make coffee, and won’t include the famous WMP (write my paper) button. But yes, if there are any financial investors or business angels in the audience who want to contact me — seriously — they are welcome! iObserve for Leopard only (v1.0.3). Free. Do you plan to produce linux version? Hi Cedric. I made a common interface to resolve coordinates for objects in Simbad, NED, SkyBot, Exoplanet.eu, the CBAT supernovae list, the MPC Ephemeris Service and SDSS. It is at http://www.strudel.org.uk/lookUP/ and can return output in XML e.g. http://www.strudel.org.uk/lookUP/xml/?name=M42 Not sure if that is the sort of thing you’re after. What’ve done is really nice! I don’t know yet if that could be useful for iObserve, but I will definitely have a detailed look (I’m traveling this week). I have no linux version planned. Sorry, already too many exciting things to do on the OSX/iOS platform. For the quickest of you, here are some codes to get free copies of iObserve 1.0.5! Just enter one of these code inside the MacAppStore application (the pane to the right). Finally, I’m back. Not super easy to release iObserve while traveling! The feedback from users I received so far is really fantastic, and I will certainly work hard to make an iPad version. To thank you all again, here are 5 more promo codes! I’ve just downloaded the i-observe 1.0.5v for Leopard, its awesome! I am having problems trying to upload the source names and coordinates from a file: the bottom “CHOOSE” simple does not work. Are you planning to solve it in the near future? I read your comment only now. Yes, this problem has been solved with the 1.0.6 update! I have a technical difficulty in getting iObserve. In India, the apple AppStore does not allow one to buy iObserve, it is not added to Apple India appstore. It seems Apple divide the what you can buy from its store based on where you live. Can you please ask Apple to include it in its India Appstore? or alternately tell me how I can get it without getting getting involved with Apple app store. Also please include our Observatory in the list, It is called Gurushikhar Observatory, Mt. Abu. We have our own IR optimized 1.2m telescope, and we are in the process of getting a 2.5m telescope. It is at an altitude of 1680meters, Latitude +24.6530556000, and Longitude 72.7794440000 East. We have a fiber fed optical high resolution Echelle spectrograph and a an infrared Camera with Hawaii-I array which works in the JHK bands. The Observatory is owned by the Astronomy Division of the Physical Research Laboratory, Ahmedabad, India. I have been myself able to change from french to indian Mac App Store, and find iObserve! You should probably give it a new try. iObserve is sold identically worldwide. As for the observatory, it is noted! Thanks. (P.S. Thanks Kelle for the ping). Amazing piece of software. But I’m a linux user. Is there a chance for you porting iObserve to Linux? Hi, first of all thank you, very nice and useful software. One request though, it appears there is no way to export the list of objects. In many observatories it can be very handy to send a list of objects you want to observe to the telescope operator. Or just send a list to a colleague or student who is going to do the observations. Thanks very much for your interest in iObserve. The export feature has already been requested by some other friendly users. I am currently working hard to prepare iObserve 1.1 and iObserve touch on iPad. This export feature will definitely make it to the 1.1 release! Really usefulm, easy, versatile: good job! There is a mistake in the coordinates of the LMT observatory: longitude should be -97deg instead of +97deg as it is written in the program. Thanks Elena, I’ll correct it for the next version (that I am currently preparing). I loaded this app tonight and was up and running immediately on my MacBookPro. A very useful tool. The price has gone up since the above writeup. It was $19.99 at the Apple Store. Hi Cedric. Thank you for your work. What home devices recommended me to connect a telescope to a Mac? I wish I had something basic that can handle OSX and at a low price. Thank you.